In this case, when appears the symbol "curved arrow on a paper" (photo below), you have just to click it: you will have the print options... and you can print in Wifi. 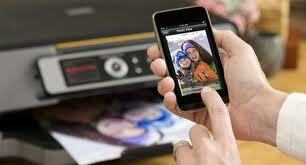 There is an inconvenience: the Mac must be turned in order that there is a communication between the printer and Ipad or l'Iphone. 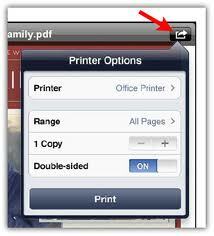 When I hit the printer box thingy with arrow, I get open in safari, share via email or copy URL.